The Ares V (formerly known as the Cargo Launch Vehicle or CaLV) is the cargo launch component of the upcoming Constellation program, which will replace the Space Shuttle after its retirement in 2010. Initially, the Ares V will launch the Earth Departure Stage and Altair lunar lander when NASA returns to the Moon, which is currently planned for 2019, but will also serve as the principal launcher for missions beyond the Earth-Moon system, including the program's ultimate goal, a manned mission to Mars after 2030. The unmanned Ares V will complement the smaller, and human-rated Ares I rocket for the launching of the 4-6 person Orion spacecraft. Both rockets, deemed safer than the current Space Shuttle, will utilize technologies developed for Project Apollo, the Shuttle, and the Delta IV EELV program. 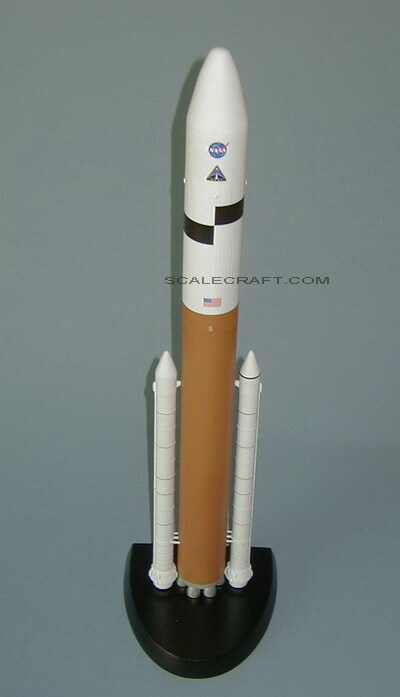 The Ares V will be able to carry about 188 tons (414,000 lb) to Low Earth orbit (LEO), and 71 tons (157,000 lb) to the Moon. Upon completion the Ares V will be the most powerful rocket ever built, lifting more into orbit than even the American Saturn V, the failed Soviet N-1 for the cancelled Soviet Moonshot, and the successful Soviet/Russian Energia booster developed for the Buran Shuttle. The Ares V and the smaller Ares I are named after Ares, the Greek god of war, which is the equivalent to the Roman god Mars. Mahogany wood. Scale: 1/100. Length 24 inches.